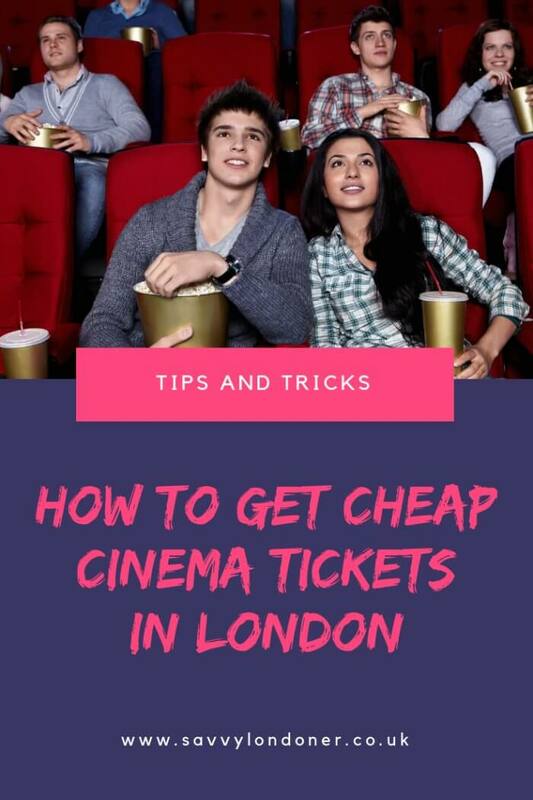 Want to get cheap – and even free cinema tickets in London and the UK? Let me teach you how with these deals, tricks and discounts. Cinema tickets in London are expensive, going up to more than £25 (!) for 3D films in some central London locations. When compared to movie prices in other countries, it might feel like we’re getting robbed – and even when compared to cinema ticket prices in the rest of the UK. Thankfully, there’s almost no reason to pay full prices. Personally, ever since I moved to London, I don’t think I paid full price for a cinema ticket even once. So here are some of the best deals and discounts for cheap cinema tickets. Note: While I focus on London, most of these deals work all over the UK. 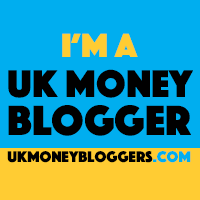 Note 2: I try to keep this page constantly updated – but deals can constantly change. Tickets have different prices in different locations: A ticket in Leicester Square is going to cost a lot more than the South East. And sometimes the prices are different in the same area – so check around! Bring food and drinks from home: Snacks and drinks at the cinema sometimes cost more than the ticket! Most cinemas won’t give you trouble for bringing food/drinks from home – as long as you don’t bring HOT foods or ALCOHOL. Bring your own 3D Glasses: 3D glasses add to the cost of the ticket. Keep them for next time – and you’ll pay less. Multiple price points and “upgrades” – Some cinemas offer “improved” screens (such as Cineworld’s SuperScreen), “upgraded” chairs, balcony seating, or gimmicks like the 4D Cinema (with moving chairs). These cost more – consider whether you actually need any of them. These offers and discounts are good for most of the big cinema chains that operate in London. Probably the ultimate cinema “trick” – Get two cinema tickets for the price of one, every Tuesday or Wednesday, once a week – for 12 months. The cost? Less than two pounds. Cinemas: Cineworld, Odeon, Vue, Picturehouse, Empire and several independent cinemas. Ticket Type: 2D (You can pay to upgrade to 3D, IMAX, etc’). How to get it: Meerkat Movies is a benefit for online clients of comparethemarket.com, a financial comparison site. You can get the deal by using their comparison engine to get a quote (on insurance, broadband, energy, etc’), and then buying via one of the quotes you get for them. Then, once you buy the insurance (via comparethemarket), you’ll be able to activate your Meerkat Movies deal. From now on, every week (for 12 months) you can get a code, which you will then use either at your favourite cinema’s online ordering website or at the box office. And when your 12 months are up? Just go through the process again. Extra Savings Tip: Many of the other deals listed here can stack up with the meerkat deal. So, for example, if you buy a cheaper student ticket, you can then use Meerkat’s code to get TWO tickets for the same student price. There’s A Catch… If you order your cinema tickets online, most chains will charge you an “online booking fee” (usually less than £1). You will still need to pay the fee on BOTH tickets with the Meerkat deal. If you’re a student, with a NUS (National Union of Students) card you can get cheaper tickets in most London cinemas – the level of discount changes between the cinemas. Days: Depends on the cinema (some only on weekdays). Ticket Type: Most screenings (you get a discount). How to get it: First, you need to get a NUS card. Once you have the card, you can buy the cheaper student tickets at the cinema – just remember to present the card. Extra Savings Tip: You can double up your savings by buying one cheap ticket – and then get the Meerkat 2 for 1 deal (see above). There’s A Catch… The NUS card itself costs £12/year – but it offers a lot of additional discounts and deals. If you collect Tesco Club Card points, you can use them to get cinema ticket vouchers (Currently at £4.50 for an adult ticket). How to get it: Tesco Club Card website. Extra Savings Tip: I haven’t tried it personally yet, but there’s a good chance you can stack this up with the Meerkat 2 for 1 deal (on Tuesdays and Wednsdays). 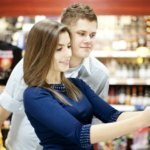 Tastecard is a paid membership card that gives you discounts at restaurants (Either 50% off or 2for1). Their upgraded tier, Tastecard+, also gives you discounts on events and tickets – including up to 40% off on cinema tickets. How to get it: Once you join Tastecard+, You buy vouchers for pairs of tickets, in effect getting 2for1. Extra Savings Tip: You can often get free monthly trials or other cheap membership deals. But be careful – these will usually auto-renew for full price unless you cancel them. There’s A Catch… You have to order the vouchers from Tastescard – you can’t buy the tickets directly at the cinema. Groupon is a well-known deals and coupons website. Ocasionnaly, they offer interesting deals on cinema tickets. Cinemas: A changing selection of big chains and small independents. How to get it: Check this page on Groupon. There’s A Catch… Always check the small print – some Groupon offers are notorious for annoying small-print conditions. Each big cinema chain – as well as some of the independent cinemas – have their own special deals and discounts. Here are some of the best. Odeon (first established in 1928) is the largest cinema chain in the UK (in terms of market share). The quality of their screens and seats heavily depends on the location – some are wonderful, and some… less so. Do note that in most locations, Odeon doesn’t let you pick seats in advance (even if you order online) – some love it, while I personally tend to avoid Odeon for that reason alone. Navigating all the deals and discounts Odeon Cinemas offer might require a physics degree – but hey, there’s no such thing as too many discounts! Odeon Limitless: An unlimited annual subscription service, that lets you watch as many movies as you want, whenever you want. Only works with regular, 2D screenings – but you can pay to upgrade. The cost is either £19.99/month for ALL of Cineworld’s locations, or £17.99/month for all the cinemas EXCEPT the ones located in Central London (where the tickets are more expensive.) You also get 10% off the food and drinks at the cinema, as well as several other discounts and promotions. You can pay monthly (via direct debit) or for 12 months in advance, with a 5% discount. Is the Limitless deal worth it? As with the similar Cineworld deal, it depends. If you go by yourself to the cinema and pay full price, more than TWICE A MONTH – then it might be worth it. However, if you usually go as a couple, to one or two movies every month, the Meerkat Movies 2for1 offer might be better for you. My Odeon: Customers who register to Odeon’s website and order their tickets online, get a 10% discount off their order (excluding the annoying online booking fees). Unlike “My Cineworld Plus”, there’s no yearly fee – the registration is free. It’s not “compatible” with most of the other discounts presented in this article – but registration is free, so you might as well give it a try. Odeon Première Club – Earn points every time you buy something at an Odeon cinema (or their website) – every £1 you spend earns 10 points. You can then use those points for snack, drinks or free tickets – for example, an off-peak adult 2D ticket will cost you 600 points and a small popcorn is 400 points. Joining the club costs money – the “Classic” tier costs £1.99, and you get a “bonus” of 100 points. Odeon Screen Unseen: Feeling brave? The Screen Unseen deal lets you book tickets in advance for only £5 (or £5.75 online). The catch? These are preview screenings where you don’t know what movie you’re going to see. Odeon promises “5-star movies” – but you’re only going to find out what it is once you’re already sitting down at the cinema. And if you prefer horror films – there’s a similar Scream Unseen scheme. Odeon Family Value: Odeon offers several deals for children and their families on selected screenings. A “Family Ticket” lets a family of four pay child ticket prices for the whole family (either 2 Adults 2 Children, or 1 Adult 3 Children). Child and Teen tickets offer discounted prices for children (under 12) or teens (13 to 17). And “Odeon Kids” are special screenings, during weekends and holidays, where kids pay an even cheaper price (usually £2.5 to £3.5). Silver Cinema for Seniors: Guests over the age of 55 can attend special discounted screenings (from £3) that include – of course – tea, coffee and biscuits before the film. The Times 2for1: If you’re a Times (or The Sunday Times) subscriber, you can get 2for1 tickets every weekend with a special code. Additional Odeon Deals: Of the deals mentioned above, Odeon is currently also compatible with Meerkat 2for1, Student Discounts, TESCO points and Tastecard+. Cineworld is the second-largest cinema operator in the UK with over 800 screens. The quality of screens and seats really depends on the location – some sites (like the O2 in North Greenwich) are top notch, while others are in dire need of refurbishment. Cineworld Unlimited: An unlimited annual subscription service, that lets you watch as many movies as you want, whenever you want. It only works with regular 2D screenings, but you can pay to upgrade. After a full year, a Premium Unlimited card will upgrade you to unlimited 3D screenings. The cost is either £20.40/month for ALL of Cineworld’s locations, or £17.90/month for all the cinemas EXCEPT the ones located the West End (where the tickets are more expensive.) You also get 10% off the food and drinks at the cinema, as well as several other discounts and promotions. Is the unlimited deal worth it? It depends. If you go by yourself to the cinema and pay full price, more than TWICE A MONTH – then it’s worth it. However, if you usually go as a couple, and usually go to one or two movies every month, the Meerkat Movies 2for1 offer might be better for you. My Cineworld Plus: Ordering cinema tickets online comes with the added “benefit” of paying annoying “processing fees”. To sugarcoat that, Cineworld is offering a “Cineworld Plus” subscription for online users – you pay an annual fee of £4.95 and get a 10% discount on all future bookings, as well as £6 in discount vouchers for snacks and drinks (once a year). 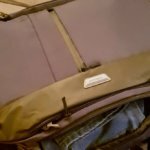 However, these discounts DO NOT stack up with most of the other deals presented in this article – so personally, I wouldn’t bother with it. 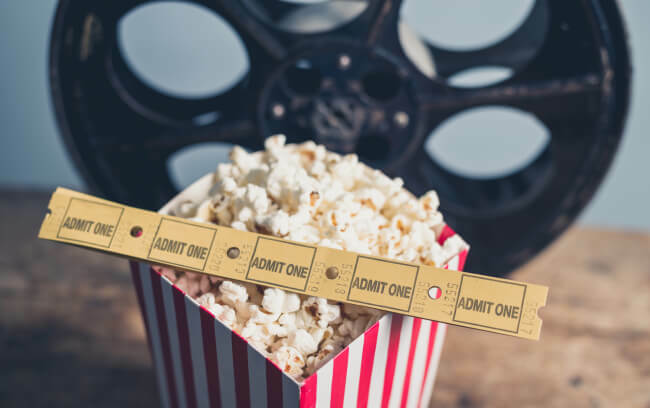 £2.5-£5.50 Cineworld Movies for Juniors: Children under the age of 16, can get £2.5 tickets for regular screenings of movies for children (usually on weekend and holidays). The accompanying adults pay full price. “Premium Movies For Juniors” are new releases (of movies for kids) – and those cost £5.5 in selected cinemas. Learn more here. Three’s Wuntu App – Free / Discounted Cineworld Tickets: If you’re a Three mobile subscriber, you can download their weirdly named Wuntu app – it offers deals and freebies every week, and on occasion, you will find discounted (£3) – and sometimes even free – tickets to Cineworld. They’re only for regular (2D) screenings, but you can pay to upgrade. Find out more here. Additional Cineworld Deals: Of the deals mentioned above, Cineworld is currently also compatible with Meerkat 2for1, Student Discounts, TESCO points and Zeek gift cards. 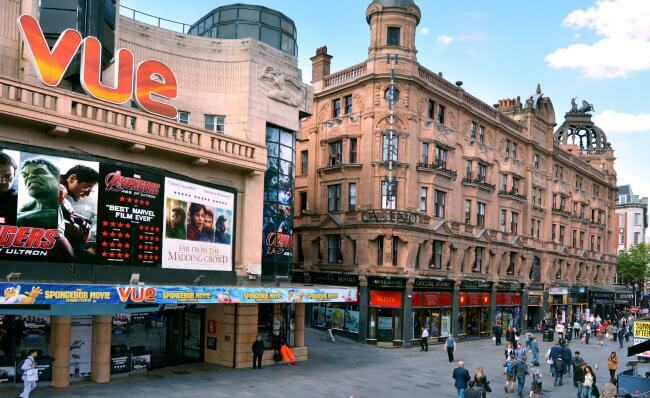 Operating under the VUE name since 2003, Vue is the third largest cinema chain in the UK with 87 cinemas and 840 screens. In addition to the chain-wide promotions, local Vue cinemas sometimes have their own promotions and discounts, so it’s best to check the one closest to you. 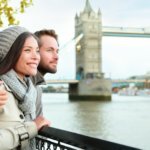 Vue Super Mondays: Go to a movie on a Monday, and pay only £4.99 per ticket (£3.99 outside London) at all Vue cinemas EXCEPT the one at Leicester Square. To get the cheaper tickets, you need to register online, get a unique promo code, and then either use it when you order online or show it at the box office. You can use the same code every week. Vue Mini Mornings: During weekends and school holidays, kids (and accompanying adults) can purchase tickets for special kid-friendly screenings for £2.49 per ticket. Note that you usually won’t find the newest releases on these screenings. Nectar Points: If you collect Nectar points (that’s Sainsbury’s club card), you can swap them for Vue tickets. Every 500 points are worth £2.50 off the ticket price. Note that you can use these to order online – you have to present your Nectar card at the cinema. Senior Screenings: Special discounted screenings for over-60’s. And yes – the tickets include tea and biscuits. Club Lloyds: If you happen to have a Club Lloyds bank account, you can get 6 free VUE cinema tickets every year. £5 AnyDay Tickets: Some Vue cinemas offer £5 Tickets to any screening on every day – unfortunatley, their London cinemas are excluded as of this writing. Additional Vue Deals: Of the deals mentioned above, Vue is currently also compatible with Meerkat 2for1, Student Discounts and Tastecard+. Empire is a smaller cinema chain, with only a handful of screens in London (the original Empire Cinema in Leicester Square was sold to Cineworld). Saver Tuesday: Discounted £4.95 tickets on Tuesdays for regular, 2D screenings. Last Chance Thursday: Discounted tickets for movies that are ending their run on a Thursday. Empire Seniors: Special screenings every Wednesday morning for over-60s, at £3.5 per ticket. And of course – tea and biscuits included! A small chain owned by Cineworld, with several cinemas throughout London. While they do show blockbusters, you’re more likely to find smaller art-house style films as well as all-time classics. Picturehouse Membership: For an annual fee, you get a set number of “free” tickets (either four or eight, depending on your membership level), discounts on additional tickets, food and drink, and a few other perks. If you’re only buying the membership for the “free” tickets, don’t bother – buying them outright will, in most cases, come out cheaper. Happy Mondays: In some of the Picturehouse cinemas, tickets on Mondays cost £5.5 for members and £7.5 for non-members. Family Tickets: Discounted tickets for groups of four, where at least two are under 15. Free Student Screenings: “The Slackers Club” (yep, that’s the name) offers free tickets for students, on special preview screenings. Barclays Premier Rewards: If you happen to be a Barclays’ Premier Rewards member, you can get a free annual Picturehouse membership. Barbican Cinema Monday Madness: Mainly art-house and foreign films, on Mondays you can get a ticket for £6. Curzon Membership: A mix of art-house style films, current blockbusters and all-time classics. The Classic annual membership (£65.00) will give you 4 tickets, discounts and free entry to classic movies. The Cult membership (£350!) will give you free entry on basically everything, discounts for friends, and a few other perks. Rio Cinema (107 Kingsland High St, E8 2PB) – A community cinema in a beautiful building, you can either get a membership with free tickets and discounts, or go for the Cheap Monday tickets at £7. Lexi Cinema (194b Chamberlayne Road, NW10 3JU) – Another community cinema, where all profits go towards charity. You can either get a membership (with free and discounted tickets) or go on Mondays when tickets are £7. The Castle Cinema (64-66 Brooksby’s Walk, E9 6DA) – A cinema that’s been around for more than 100 years, you can either get an annual membership (with free/discounted tickets) or go on Mondays, when tickets are only £6. Rich Mix (35-47 Bethnal Green Road, E1 6LA) – A community centre offering a real, well, mix of both live performances and movies. You get a membership (with free/discounted tickets) or go on Mondays when tickets cost £6. Genesis Cinema (93-95 Mile End Rd, E1 4UJ) – You can either get a monthly membership that offers UNLIMITED entrance to their smaller screens, or go on Mon-Weds when tickets cost £5 to their regular screens, and £9 to the “luxurious” ones. Prince Charles Cinema (7 Leicester Pl, WC2H 7BY) – Mostly art-house and older, classic films, a paid membership gives you access to discounted tickets – including £1 screenings once a week.